MORE than 200 skeletons found buried under Gibraltar’s old St Bernard’s Hospital could have been victims of an 18th century siege. A scientific team has discovered that the mass grave – unearthed in 2014 – is home to mostly young men who were buried in haste. 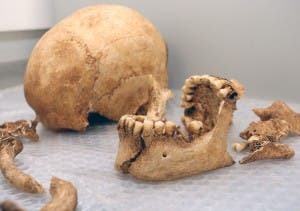 The collaboration between the Ministry for Heritage, Gibraltar Museum and the University of Cambridge is continuing to analyse the remains in order to reveal more about the lives of those buried. It is also possible they died from one of the disease epidemics which followed the sieges, while some of the remains date back as far as the 16th century. In the 18th century the hospital site was used by the British military, which fits in with the theory it was a military burial ground. Today the old Colonial hospital site is home to St Bernard’s first and middle schools. The human remains analysis team is led by Dr Emma Pomeroy and aided by a group of local volunteers.